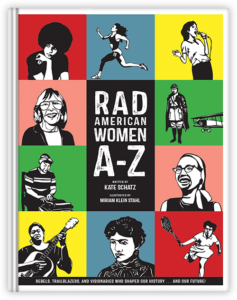 Written by Kate Schatz and illustrated by artist Miriam Klein Stahl, the Rad Women books are children’s books…for everyone. 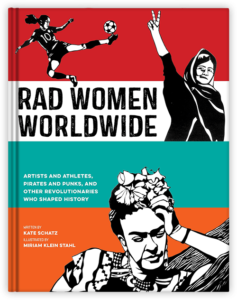 Each book presents a diverse, eclectic, and inspiring selection of women of all ages who have made the world rad. Miriam and Kate work together on all aspects the books, and are both committed to making impactful books with strong messages of justice, peace, and equality, that leave readers feeling empowered—and ready to take action themselves. Rad Girls Can is the third full book in the Rad Women series. Bright and energetic in its design, the book tells 50 stories of young women who’ve done incredible things before age 20—from winning gold medals to becoming CEOs to running for office. The idea for the book came from the many young readers who have come Rad Women book readings, assemblies, and talks, and asked: “Can you make a book about people my age?” After hearing this request numerous times, Kate and Miriam decided to listen, and to make it happen. Rad Girls Can shows us the potential and the power of young, creative, hopeful, brilliant girls, and all that they can do in this world. While some of the stories in Rad Girls Can are about girls from history, many are contemporary, and show how young people are engaging with and shaping the future of some of our most urgent issues, including voting rights, climate change, immigration, gender and sexual identity, disability rights, and racial justice. Positioned as an A-Z book about cool women from American history, the book’s bold papercut illustrations, bright colors, and direct, accessible text have made it “a cultural phenomenon.” Kate got the idea for the book in 2011, when her then-two-year old daughter was taking a nap—she realized she wanted to create a book for her daughter that would teach her about feminist histories in a fun, honest, and engaging way. In 2014, after giving birth to her son and feeling even more inspired to create a book celebrating strong women, she reached out to Miriam to see if she’d like to collaborate. They pitched the project to City Lights Books, via the editor and writer Michelle Tea—and the rest is a small slice of herstory. With an iconic cover designed by Jason Pontius, the book quickly went viral, selling out its print run before it even hit the shelves, and garnering media attention everywhere from Yahoo to MTV to Bust to AfroPunk. Rad Women Worldwide is the follow-up to Rad American Women A-Z. The idea for an international sequel came from students, parents, and teachers who a book with a global focus. Rad Women Worldwide is a bold collection of 40 biographical profiles, each accompanied by a striking illustrated portrait, showcasing extraordinary women from around the world. Featuring an array of diverse figures from Hatshepsut (the great female king who ruled Egypt peacefully for two decades) and Malala Yousafzai (the youngest person to win the Nobel Peace Prize) to Poly Styrene (legendary teenage punk and lead singer of X-Ray Spex) and Liv Arnesen and Ann Bancroft (polar explorers and the first women to cross Antarctica), this progressive and visually arresting book takes the Rad Women series to the next level. Rad Women Worldwide has been translated into Portuguese; Korean and Spanish-language translations are forthcoming. A fun, inspiring journal that encourages its owners to think, create, reflect, and explore their own radness. 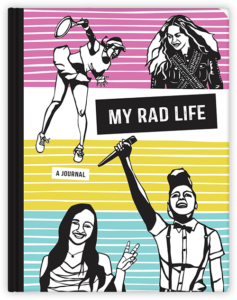 This cool guided journal draws from a few of the “rad” women featured in both books, while also including a diverse range of new women—from Mindy Kaling to Grace Lee Boggs to Beyonce—all of whom come to life via inspirational quotes and paper cut portraits. Blank pages invite doodling, lined pages encourage writing, and a collection of thought-provoking prompts encourage users to get to know themselves better by recording their thoughts and ideas on paper.